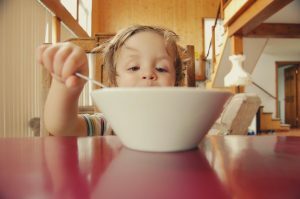 Home › Articles › Is your child a fussy eater? Not all fussy eaters are infants and toddlers. Some of these finicky eaters are growing beards! However, it is never too late to adopt healthier eating habits and have less stressful mealtimes. It is the responsibility of the parents or caregiver to decide what’s on the menu. It is the child’s responsibility to decide whether he is going to eat. Your child will eat if he is hungry, even if it is not his favourite food that is served. Your child himself will decide how much he is going to eat. Trust him to know when he has had enough. Cook one healthy and balanced meal for the whole family and do not offer other options if your child does not want to eat. Try to establish a fixed routine. Your child must know the exact times of meals and scheduled snack times, and do it in the same way every day. In this way your child will learn when to expect food and it will help him to arrive hungry at the table. Your child will be more inclined to try out new dishes if he is hungry. Let meal time become a priority. Sit down at table as a family and eat together, not while your child is walking around or is watching TV. Be a good role model. You will have a hard time persuading your youngest to try out a dish if his older brother or you yourself is not prepared to eat it. Therefore, make sure that everybody gets the same food. If your child refuses to eat during meal time or snack time you should only offer food again when the next scheduled meal time or snack time is due. If he eats too little during supper, he will make up for it by eating a hearty breakfast. Meal times should be happy family times. Stop pressuring your child to eat and just enjoy the time together. Steer clear of pressure, praise, rewards and punishment. Give your child the independence he is craving by trusting that he will eat when he is hungry. Do not allow your child more than 30 minutes to eat his food. When the time is up, you should remove the food and your child can go and play. Let your child become involved in the preparation of the food and help to lay the table or pour water. Gardening is a wonderful way of making your child fond of vegetables. Let him plant and water the plants and watch proudly how his vegetables are growing. He will very much want to eat these vegetables. Plan together. Let your child choose one or two ideas per week for heathy meals that he would like to eat. Everyone must then eat this food together at meal time. Theme evenings can be enjoyable and exciting. Choose dishes from different parts of the world. Give some foods amusing names. You could, for instance, call a green smoothie a monster juice. Let your child make up the names himself. Do not give up. If your child does not enjoy or does not want to taste a particular dish, you can serve it again in a few days’ time. Perhaps you could try another recipe or method of preparation. Sometimes it can take up to ten tries before he will begin to enjoy a new dish.